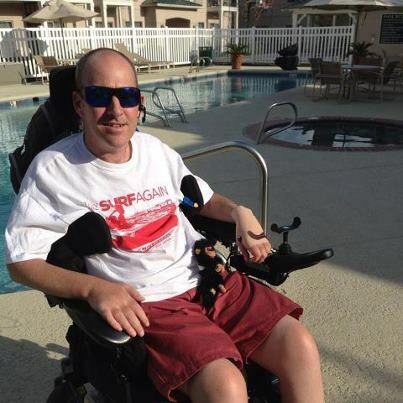 On August 31st, select South Walton restaurants will host Dine 4 Danny—a dine-out fundraiser to support Danny Margagliano, a former South Walton Fire District fireman and paramedic who was paralyzed in a diving accident, leaving him to struggle daily with overwhelming medical expenses and needs. Locals and visitors are invited to show their support for Danny simply by dining out at one of the participating restaurants this Saturday. Each restaurant will be donating either a percentage of sales or a minimum contribution following the event that will go directly to Danny’s charity fund, Donations 4 Danny. On a holiday weekend that celebrates the American worker, Dine 4 Danny invites all to enjoy a delicious evening out in honor of Danny who devoted years of his life to the safety of our local community. Today marks a very important day for me. April 14, 2012 one year ago was the day of my initial spinal cord injury. I’ve had some mixed feelings today. I woke up this morning feeling well and excited to go to a Joel Osteen service at his home church, Lakewood Church, in Houston Texas. Some of the feelings that I’ve had this morning that were not of the most positive. They were feelings that time is flying by and I’m not making enough improvements and even feeling a little bit nauseous at times just thinking that I’ve actually been confined to a wheelchair as a quadriplegic level for one year. This all was quickly wiped away once I arrived at the huge stadium Lakewood Church. It gave me time to actually feel the gratitude and achievements that I’ve made in this past year that I should be feeling. 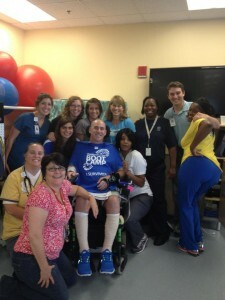 Thinking back to when I was at Shepherd Hospital in Atlanta Georgia, lying in bed coming out of an induced coma, still on a ventilator, not able to move any of my limbs, and to where I am now only one short year later is nothing short of a miracle. This is where the pity party stopped and excitement, motivation, and feelings of being blessed came rushing through me. 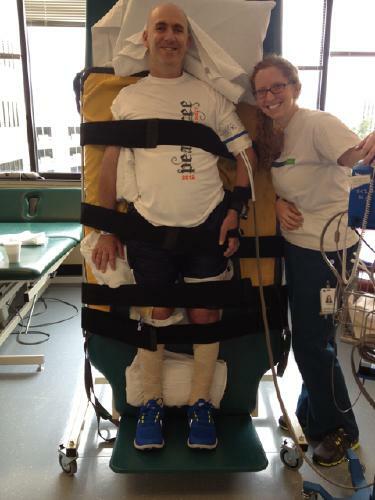 I am in Houston Texas, for a trip of a little bit over two weeks to see spinal cord specialists and visit the top physical therapists for spinal cord injuries in the country. I saw many doctors last week and received mainly all positive outlooks. I start physical therapy tomorrow and I am getting really pumped about it right now as I sit here writing this. This is one of the things made possible from proceeds from this past year’s fundraisers and of those of you who have donated directly to www.Donations4Danny.com. I’m so grateful to have this opportunity and want to thank all of you for giving it to me. Your love and generosity has never been or will ever be wasted or taken lightly and I am going to use it to it’s fullest possible potential. You all have been truly amazing and I am honored to have been touched by your love, prayers and positive thoughts. There have been so many events both good and bad throughout this past year that have made me a stronger, better, and more blessed person that I have ever been. I have two long weeks of therapy coming up and will keep everyone posted once I get finished. I want to thank everyone for all of your support whether it has been financial, spiritual, or physical. The difference between today, which is one year after my tragic accident, and the day before my accident, is that today I am able to be aware of and be thankful for all the wonderful blessings I’ve been given and surround me on this planet. It took this accident to open my eyes about many things in my life and to appreciate the smaller and larger things that are wonderful around me. I’m a better person today than I was a year ago and I am a stronger person than I ever was. Thank you for all your support that made that possible for me. 4 Months Exactly Today…Danny is Home!! Danny’s Journey Home from Craig Baranowski on Vimeo. Today is four months since Danny’s accident. These past months have been filled with so many emotions. Danny and I are actually home right now! Danny was having low blood pressure issues so he couldn’t do his last day of therapy so we decided to head home early and surprise the kids and my sister and nephew(who have been staying at our house to watch the kids). On the ride home Danny and I talked about how the last 4 months have been and then we figured out that today marked 4 months exactly since his accident and how fitting it was that we were actually coming home today. Danny said the last four months flew by and I said,”for who? ?, you maybe!” He said” well yea because I guess I was in a coma for about a month of it and hallucinating for the next two weeks after that!” hahaha! It’s so true! The kids were so super excited to see us! They made this fantastic welcome home posterior us in anticipation of our arrival on Friday. They all ready had it up and in place. I can’t tell you how good it feels to be back home. Even though I’m sleeping on the couch next to Danny’s hospital bed that’s set up in the living room, it’s still so nice. Summer is cuddled up next to Danny in the bed, so sweet. I’m the only one awake, my head still buzzing from the day. Well me and Stormy, our dog, who was also supper excited to be reunited with all the family. We all missed her so much! She put her paws right up in Danny’s lap when she saw him. Thanks to our friends Daniel and Sarah who have taken her in as their own for the last four long months! We can’t wait to see everyone over the rest of the week. Danny was filled with emotions being back in the house tonight and the kids wanting his attention and he can’t get around like he used to. He was pretty shook up if you can imagine. He just wanted to be able to sit at the bar and talk and he cannot do much for himself. It’s going to take some time but we haven’t got this far without a lot of blood, sweat and tears(literally) and the wonderful support of family and friends. And we will continue to string with the love and support of all of you. There may be times when Danny gets overwhelmed and may just turn away. Please understand that he just needs some space and a few minutes to regain composure. This is a new way of life and does not present itself without many difficult challenges and emotions. and with that I’m resting my eyes for and early and busy day tomorrow! Love and blessings to all! Good to be home! Good to be home! Hi all, it is danny. I am writing this from my IPad using a stylus taped to my finger. I want to first thank all of you out there reading Aprils posts and writing beautiful and inspiring comments and praying for me but especially my family. The past 3 months have been both the best and worse of my life, but actually more of the best. I have cried more in two months than I have in my entire life. Many of the tears were From immense pain and sadness but more were from happiness from discovering how blessed I am today. I have bonded and grown closer to all of my family especially my brother Greg and for that I am eternally grateful. I never knew how many people cared for us and helped us without thinking twice emotionally,spiritally and financially. It has unfortunately taken an event of this magnitude to open my eyes to how wonderful others can be and how selfish and unappreciative I have been. Looking around and meeting others here at the Shepard Center has shown me that I am truely blessed today. THis injury is something I would not want to take away if I could for the shear fact that it has opened my eyes to a greatfulness and glory as well as the bond that has formed between my family and the Lord Jesus. So many blessings have been bestowed upon me since the injury occurred. Now for an update on my physical recovery. I am getting stronger every day. April has been a daily inspiration and motivates me beyond my abilities. She is my caretaker, wife and best friend. She is just amazing. I am finishing up with in patient therapy on Wednesday and starting out patient aggresive therapy on Friday. I can’t wait! We will give you an uptadate after a few days. God bless you all and thank you for all you have done.